Hooray for the meeting of Sherman Alexie and Yuyi Morales! 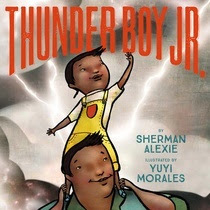 Thunder Boy Jr. is a fun book that features Native American characters who have a proud culture, but it is not the focus of the book. This is a family story that everyone will enjoy. Thunder Boy was named after his father, but is eager for his own name. He lists all the cool things he has done, considering each for his possible new name. In the end, his dad comes through with a name that fits him perfectly. I love the opportunity for discussion after reading. Kids will no doubt want to think about the exciting experiences in their lives and other potential names for themselves. This is a fun addition to your library. 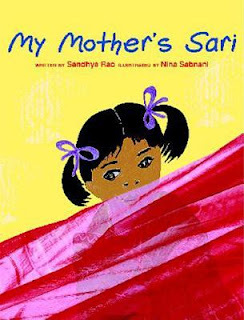 My Mother's Sari was added to the suggested summer reading list for our incoming first graders, partially because it relates to their upcoming study of cultures, and partially because it is easy enough for developing readers. Sandhya Rao wrote a book that is simple but appealing. Is it strange that the endpapers were among my favorite parts? In these, the author explains how a sari is worn. Although the story is good, the best part of My Mother's Sari is the artwork. Nina Sabnani takes a mixed-media approach, using illustrations as well as photographs of actual saris. The fabric pops and had me thinking which one was my favorite. This book could fit with a lot of different units: cultures, clothing, even creativity. I look forward to hearing family feedback about it. 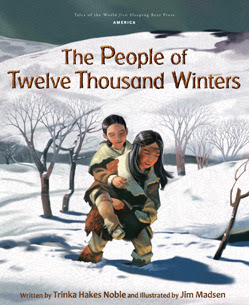 I like the idea of reading The People of Twelve Thousand Winters on Thanksgiving, rather than just books about the Mayflower and the Pilgrims. Trinka Hakes Noble's picture book tells the story of Walking Turtle, a member of the Lenni Lenape tribe, who carries his cousin everywhere, due to the cousin's twisted leg. When it is time for the coming of age ceremony, the boys will be parted because the disabled are not allowed to attend Warrior School. I thought there were interesting facts to learn and the illustrations were engrossing. But there is a huge missed opportunity: the book cuts off before the most interesting part! What happens in Warrior School? I know most young readers would like to know more about that. Adding ten more pages would have broadened the appeal of the book.